The Meet the Masters teacher greets the students with the Japanese word for hello to help introduce Katsushika Hokusai and the Asian Brush lesson. This unique style of Asian art influenced many of the world’s master artists. The children will explore techniques common to masterpieces in both the Eastern and Western world. From a very young age, Hokusai was determined to be an artist, so he sold his artwork to support himself – including writing and illustrating scary stories and creating comic books. As he developed his distinctive technique, Hokusai loved to show water in motion. In his most famous painting, The Great Wave, the foam of the wave breaks into claws which grasp for the boat of fishermen. Students learn that Hokusai created negative space to balance the huge, crashing wave. Hokusai loved showing the beautiful landscapes of his native Japan, featuring the famous Mount Fuji. He drew his stunning picture of Mount Fuji on a flat piece of wood that was sanded smooth and then turned into a woodblock print, creating his masterpiece. The students enjoy hearing some fun facts about this master artist. They are amazed to hear that Hokusai lived to be eighty-nine years old and created over thirty thousand pieces of art – that’s about one per day. He changed his name more than 30 times in his life. The name he kept for the longest was Hokusai, which means “Star of the Northern Constellation.” They are amused to hear that he was also famous for hating to clean his art studio, preferring to move instead. He moved a total of ninety-three times! Back in the classroom, students use their Learning Packet to practice Asian techniques such as Simple Line Drawings. They use a minimum number of lines to draw a house, a branch of bamboo and a crashing wave. They practice the style of Asian painters who combined structures and elements in groups and reserved some white paper for balance. Advanced students learn that in Chinese art, the artist’s unique seal is more important than his signature. They review dozens of Chinese characters depicting words such as respect, sincere, happiness and success, then create their own personal seal from a combination of pertinent characters. 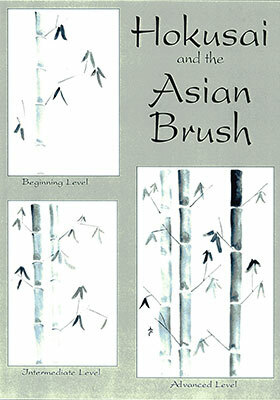 Now the students are ready to create their own Asian Art of bamboo branches and leaves. Students begin by learning the special way to hold the “ink” brush to achieve the desired effect. 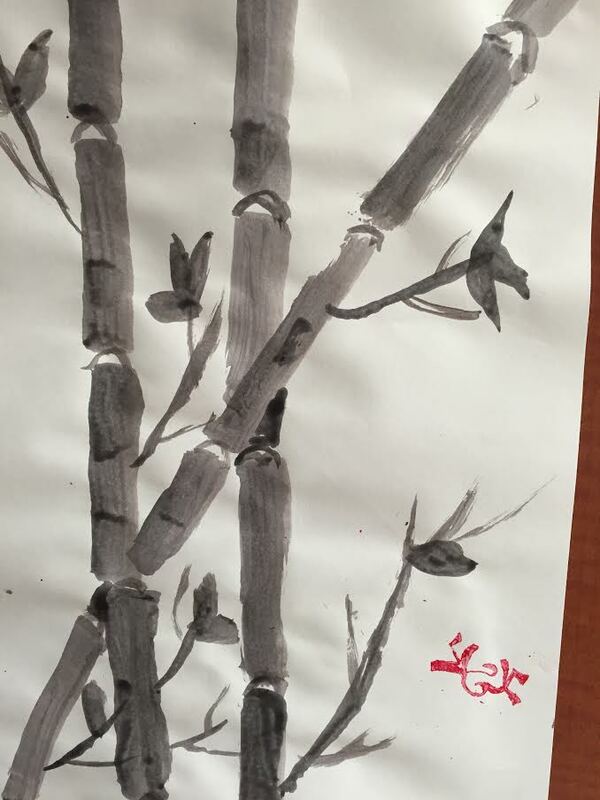 They practice painting the bamboo stalk in segments, because that is how it grows, adding details to the bamboo joints with a small paintbrush. Using very short strokes, students make thin branches, continuing until each branch is long enough. The branches grow from alternate sides of the bamboo stalk, which illustrates the old Chinese saying that the young shoots respect their elders by not blocking their sunlight. Students learn a new technique for creating leaves, shaping the paintbrush bristles into a point, pressing the bristles flat against the paper, then pulling the brush straight up. They paint the leaves in groups of two or three, just as they practiced in their Learning Packet. Students are encouraged to make each stroke masterful. As Hokusai said, “Every stroke must be alive.” Each child creates their own unique masterpiece in the Asian Brush style. Following Asian custom, the teacher thanks the students, bows and says Sayonara. 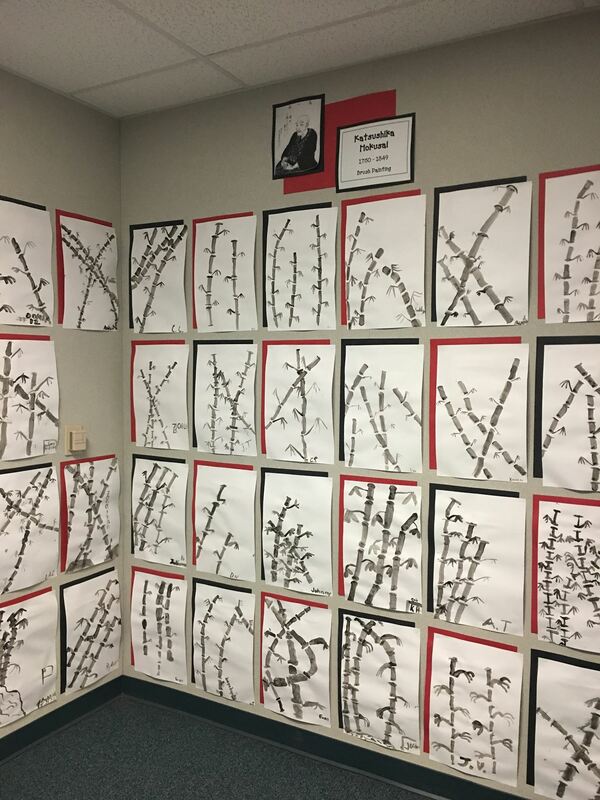 Learn more about the Hokusai lesson and see more student art.